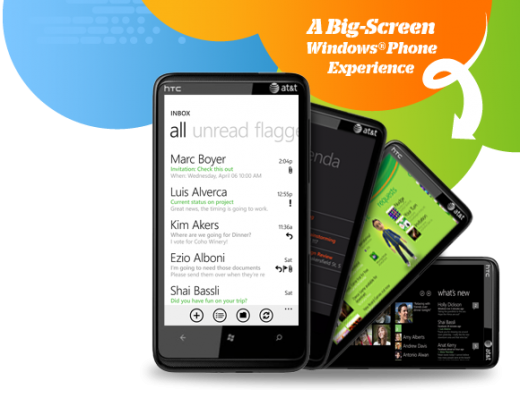 In a move that will make new waves in the Windows Phone 7 ocean, AT&T plans on releasing the HTC HD7S handset on its network this June 5th, less than a month from today. The phone will cost $199 with a two-year contract, a premium price point over other WP7 handsets that can often be found for $99 or less. AT&T said in March that the phone would land in mere “weeks,” a promise that it came somewhat late in fulfilling. The HD7S is a capable enough phone, with a 1GHz processor, NoDo pre-installed, and a 5 MP camera. What makes the HD7S special is its screen, a so-called WVGA Super LCD. When its future arrival on the network became known, its screen was the cause for the stir that surrounded the announcement. AT&T has extended information on the phone on its website. While the HD7S is a slight hardware standout in the WP7 world, that its screen even makes it notable underscores how the current line up of Windows Phones are structured: a careful toeing of the line, with every manufacturer keeping close to the minimum standards that Microsoft has laid out. In other words, the HD7S has a component, its screen, that is above and beyond the minimum resolution as dictated by Redmond, and is thus special. Contrast that with the breathing animal of Android, which sprouts a new phone-shaped limb every month that has a new gizmo or level of technological heft. Still, AT&T bothering to pick up another WP7 phone seems to bode well for the future of the platform. HTC yesterday affirmed its commitment to the platform and two new handsets began to circulate in the rumor mill.